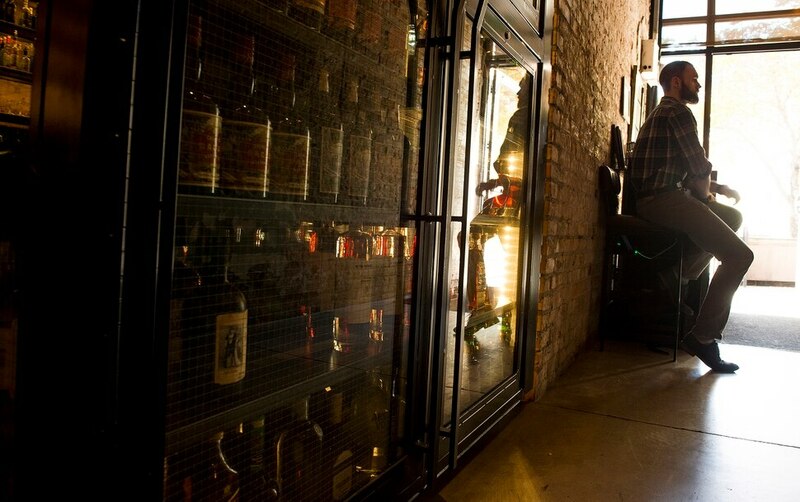 (Leah Hogsten | The Salt Lake Tribune) White Horse Spirits and Kitchen bartender Sam Wood restocks the shelves behind the bar. (Leah Hogsten | The Salt Lake Tribune) White Horse Spirits and Kitchen customer Drew Tayler has lunch with a friend, Thursday, Oct. 4, 2017. 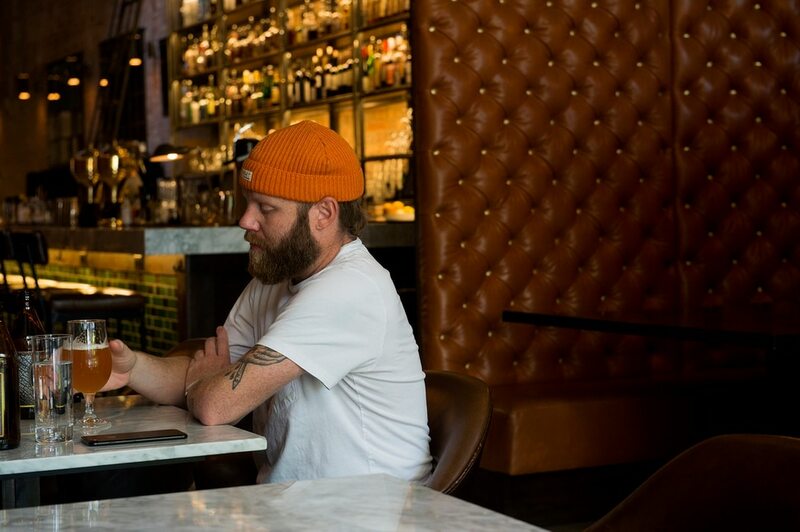 (Leah Hogsten | The Salt Lake Tribune) White Horse Spirits and Kitchen host Harrison Archibald awaits customers. (Leah Hogsten | The Salt Lake Tribune) White Horse Spirits and Kitchen's Croque Monsieur with Kurobuta ham, gruyere and mornay, $10. (Leah Hogsten | The Salt Lake Tribune) White Horse Spirits and Kitchen server Suzanne Palmer tends to customers, Thursday, Oct. 4, 2017. (Leah Hogsten | The Salt Lake Tribune) White Horse Spirits and Kitchen Reuben with house pastrami, sauerkraut, gruyere, Russian dressing on rye, $12. (Leah Hogsten | The Salt Lake Tribune) White Horse Spirits and Kitchen server Suzanne Palmer tends to customers Drew Tayler, left, and Steven Alexander. (Leah Hogsten | The Salt Lake Tribune) White Horse Spirits and Kitchen's Egg n' Chips with house potato chips. (Leah Hogsten | The Salt Lake Tribune) White Horse Spirits and Kitchen's PB&J with Berkshire pork belly, bourbon maple onion jam, brioche, radish and apple, $10. White Horse Spirits and Kitchen on Main Street is the third downtown dining and drinking establishment for the owners of The Bourbon Group — the newest sibling to Whiskey Street, next door, and Bourbon House, a block and a half north. White Horse bills itself as a modern American brasserie — an apt description given its focus on snackable dishes. 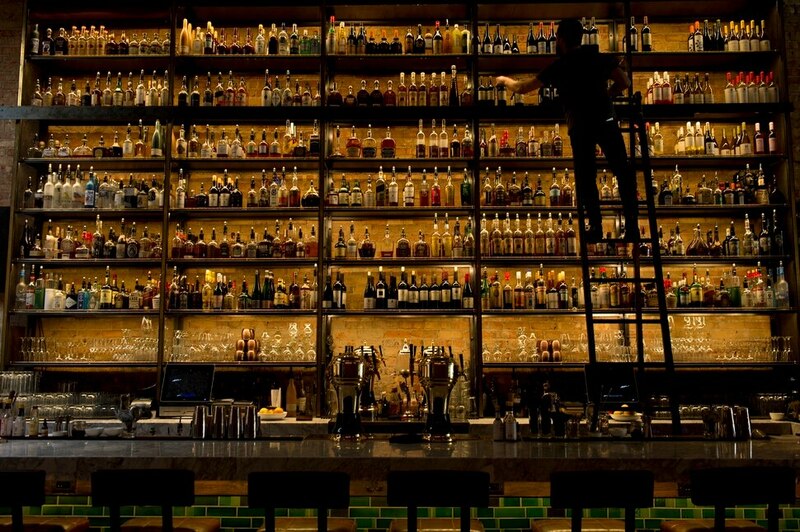 But it is first and foremost a high-end bar, with a backlit wall of bottles at the center. Its beverage calling cards are the stellar selection of aperitif and digestif liquors —including varieties from Utah’s Waterpocket Distillery — and ciders, nearly three dozen from around the world, some available on draft. Paired with fresh-shucked oysters flown in from both coasts ($18 a half dozen, $32 shucker’s dozen) and served with an adorably tiny bottle of Tabasco and $5 bar snacks, White Horse attracts a standing-room-only number of after-work imbibers. Gathered around sky-high banquettes or communal tables, guests will be delighted with executive chef Matt Crandall’s offerings that include shared plates, sandwiches, salads and entrées. Start with the creatively presented Egg n’ Chips ($5), where house potato chips are delivered hot in a brown paper bag and tossed with a raw egg, malt vinegar powder and truffle at the table. Pass on the overly salty fried gorgonzola-stuffed olives ($5), but mix and match chips and dip with a choice of understated smoked oyster, French onion or gorgonzola (all three for $12). 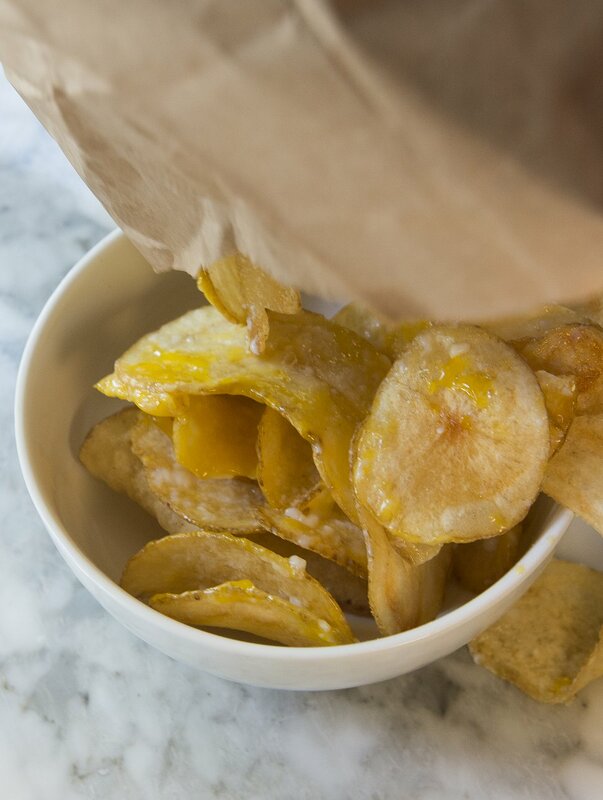 (Leah Hogsten | The Salt Lake Tribune) White Horse Spirits and Kitchen's Egg n' Chips with house potato chips. Far from the childhood favorite, the PB&J ($10) is sure to become an adult addiction with thick slices of seared Berkshire pork belly served with bourbon maple onion jam and fresh apple matchstick slices alongside crusty brioche. Other shared plates include kicky buffalo roasted cauliflower ($8) with a flourish of gorgonzola crème fraiche for dipping and steak tartare ($14). Sandwiches and hamburgers offer hearty and relatively inexpensive choices that are perfect for lunch, served with a side of pickles and house potato chips or arugula salad. The Croque Monsieur ($10) or Madame ($12) is everything you look for in this rich dish with plenty of Kurobuta ham, melted gruyère and the right amount of cheesy mornay sauce on top. A Reuben ($12) featured house-cured pastrami, tangy sauerkraut, gruyère and Russian dressing on rye and was easily split between two for a full meal. 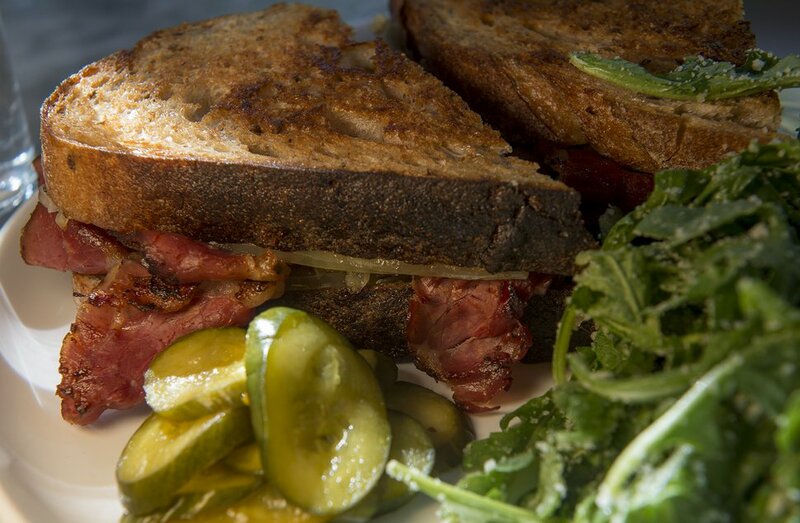 (Leah Hogsten | The Salt Lake Tribune) White Horse Spirits and Kitchen's Reuben with house pastrami, sauerkraut, gruyere and Russian dressing on rye, $12. The bacon cheeseburger ($14) highlighted a Snake River Farms American wagyu patty cooked perfectly pink and topped with smoked pork belly bacon, house pickles and American cheese. There are four salad selections, including the niçoise ($14) with grilled ahi tuna, peewee potatoes, green beans, olives, eggs, tomato and a lemon caper vinaigrette. Unfortunately, I was never able to eat a single bite after waiting nearly 30 minutes for it to be delivered one Sunday evening. It ultimately met me at the door in a to-go box with no offer of a refund. It sat at room temperature on the floor of the Eccles Theater for several hours before I threw it into the garbage, fearing the seared tuna would no longer be safe to consume. Full-sized entrees round out the menu with roasted salmon ($20), half chicken ($20), Snake River Farms steak Lyonnaise ($28) and braised short rib ($20) with cremini mushrooms, a black pepper-scotch jus and beautifully braised carrots and whipped potatoes. For dessert, save room for the bourbon butterscotch pudding ($8) topped with whiskey caramel and bourbon bacon popcorn or the chocolate molten cake with Utah sour cherries ($8). Aside from the aforementioned spirits and ciders, White Horse has a small list of craft cocktails ($10) like The Great Caper — a gin-based sipper with lemon, orgeat and caper — as well as a large selection of liquors to create anything you desire. Upwards of 30 beers also are on the menu, but wine is fairly limited, so bring your own for a $10 corkage fee. Service at White Horse is definitely reflective of a bar where you will be forced/encouraged to lounge around instead of dining at a typical restaurant pace. I experienced servers uninterested in taking orders and food delivery so slow that — as mentioned before — I received it as I walked out the door. That said, White Horse is a current hotspot among downtown bars. Those interested in just going out to eat will need to decide beforehand whether the quality ingredients and creative presentation are worth the wait. The new hotspot on Main Street in Salt Lake City, White Horse rides into town to offer niche liquors and ciders backed by a carefully crafted menu of sharable plates and hearty entrees designed to appeal to the business crowd. Hours • Daily, 11 a.m. to 1 a.m.